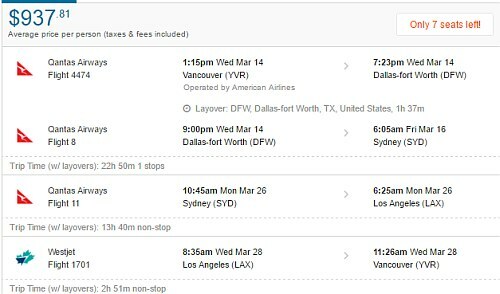 Qantas (a great airline) has dropped the price of their February, March, April, and May 2018 flights from Vancouver to Sydney, Brisbane, and Melbourne, Australia down to $937 CAD roundtrip including taxes. It's also possible to turn these into 2-in-1 trips and visit both Australia *and* Los Angeles or San Francisco, and keep the price at $937 CAD roundtrip. 2. Start by looking for a regular roundtrip flight. TIP: Try starting with Monday, Tuesday, Wednesday, and Thursday dates. Once your search completes, click on 'Flexible Dates' and look for the flights that are $937. We can see that it's from March 14 to March 28. 3. Now we can try turning this into a 2-in-1 trip, and stopping over in Los Angeles or San Francisco for free. 4. As for the dates to use, for the first and last legs of the journey, try using start and end dates that are similar to the regular roundtrip flight dates that you found at the beginning, in the first step. Once your FlightHub search completes, click on 'Non-stop only' on the left hand side. 4. The non-stop flights may show up as a 'Phone-Only Fare'. Click on 'Select' to bring up the number to call (1-800-755-4580). 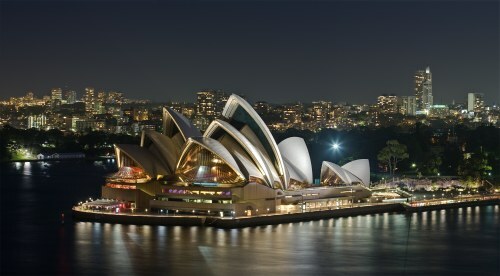 vancouver, yvr, flight deals, air canada, australasia, australia, sydney, syd, melbourne, mel, brisbane, bne, qantas and oceania. 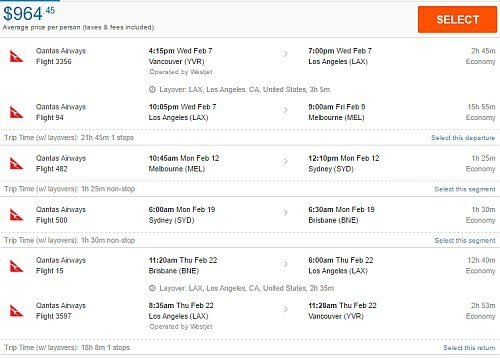 3 Responses to "Vancouver to Sydney, Brisbane, or Melbourne, Australia - $937 CAD roundtrip including taxes on Qantas | add Los Angeles or San Francisco for free"
Hi there! Thanks for sharing. 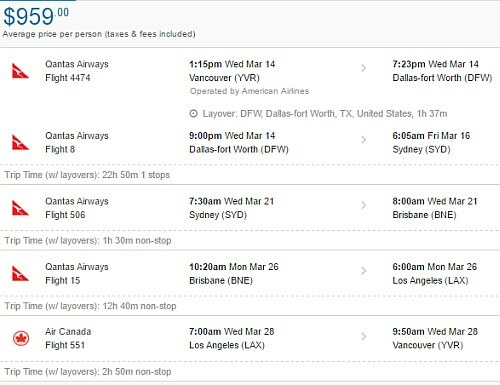 FYI aircanada has also now dropped their prices and are offering some more direct flights!!! 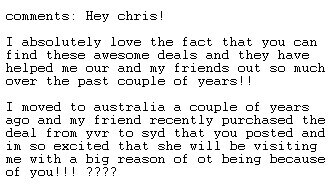 Initially, I did indeed find flights on Flighthub from Vancouver to Melbourne and Sydney via Qantas for $964 CAD, which is excellent. 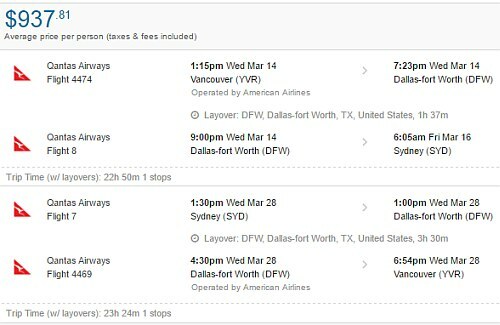 But now after returning several times, the cheapest flight I'm seeing is $1,021.93 with Japan Airlines, which entails an 18 hour layover in Tokyo followed by a 10 hour flight to Melbourne! Have I missed the window on cheap flights to Oz for now? And can we expect any more deals between now and February 2018?